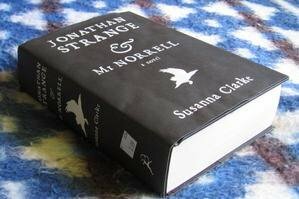 I happened across a really nice looking copy of Johnathan Strange and Mr. Norrell today in Goodwill and absolutely *could not* resist picking it up. Only $2.99 for such a tome of excellence in such condition?! But of course! I must have it! So what else is New Year’s good for? Reading, of course! What better way to spend the hours waiting for the ball to drop (in a completely literal sense, devoid of metaphore) than with some whimsical creation of Roald Dahl? Charlie and the Great Glass Elevator happened to be the cause of my antisocial descent. Having finally read Charlie and the Chocolate Factory (due to the great wisdom of library-going siblings) I figured I could do no wrong to continue in the trend. I am now trying to figure out how my childhood could possibly have been complete without Our Hero, Charlie Bucket. Next up, James and the Giant Peach. Yes, I’ve seen the movie, and yes, it was good. I have, however, too much experience with book/movie relationships and seek the whole of the story, for better or for worse. I haven’t read it all yet (having just aquired it for Christmas) so the Jury is still officially out, but this would be my nomination for the Misstitled Book Of The Year Award. While a lot of the quotes really are dumb, many are just malapropisms, slips of the toungue, or the curiously quaint interpretations of knowledge characteristic of those under seven years of age. Sure, they may be flat out wrong, but that doesn’t make them dumb. Or, for example, the much quoted assertions of the late Yogi Berra. I don’t have a clue what he was thinking when he uttered some of his most memorable sentiments, but I find them quite amusing. He seemed to have a knack for stating grains of truth with such logical impossibility that, while the thought is true, the statement obviously isn’t. For example – “A nickel isn’t worth a dime today.” Factually speaking, a nickel has never been worth the same as a dime and never will be. The thought, however – that a nickel isn’t worth as much as it used to be – is still there. There’s nothing to feed the mind like warping an old cliche into a new context. It’s clever phrasing, intentional or not, and actuall quite logical construction considering the cliche aspect. Some people call them idiots; songwriters make their living off things like “It’s like deja vu all over again.” Illustrating the concept (deja vu) you are utilizing to make your point with your sentence structure does not really strike me as the hobby of dimwits. It’s recursive nature does put a slight warp on the cranial process, but it gets the point across. It’s the sort of thing I would say on purpose. But then, maybe I’m a dumb critic.